Superfine fine gauge 100% MERINO WOOL is a premium choice of outdoor winter athletes due to its ability to hold several times it's weight in wet snow or perspiration without allowing for any heat loss. Merino Wool BULA 100% Superfine Merino Wool 18.5 micron hats are fine gauge hats lined with either Polartec 100% Polyester Micro fleece for high insulation or quick wicking Polycolon yarn for ultimate dry comfort. 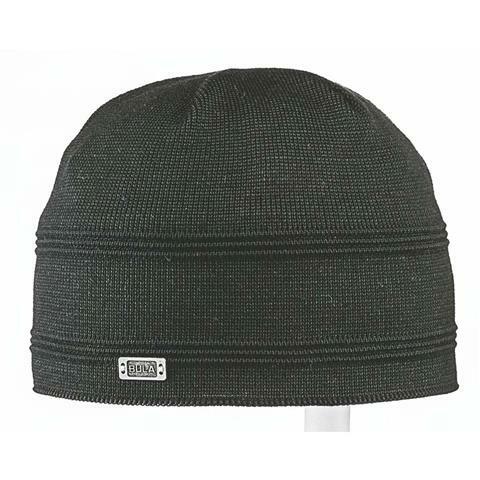 These soft Merino hats have all the efficient technical features of natural wool; insulation, breathability, odor and moisture resistance, and quick wicking properties. BULA 100% Merino fine gauge program is highly technical and heat insulating; suited for any winter activity, including aerobic sports such as skate skiing, alpine and x-country skiing, running, and snowshoeing. BULA 100% Merino program offers you a diverse selection of looks and styles that are beautiful enough for street but functional enough for all the tough stuff winter can dish out.